Hydrophilic molecularly imprinted polymers (H-MIP) with molecular recognition ability for iridoid glycosides (IGs) have been obtained via bulk polymerization combined with hydrolysis of ester groups. H-MIP were characterized by Fourier transform infrared spectroscopy (FT-IR). The hydrophilcity was measured by the contact angle measurement and the water dispersion stability. The obtained H-MIP demonstrated high selectivity and specific binding ability to five IGs in aqueous media. The group extraction efficiency of molecular imprinted solid-phase extraction (MISPE) for five IGs was investigated, including loading sample, breakthrough volume, washing solvent, and elution solvent. 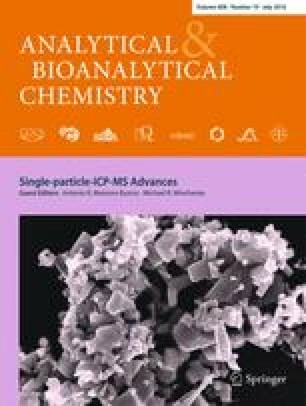 Compared with non-imprinted solid-phase extraction (NISPE), the higher average recovery (95.5 %) of five IGs with lower relative standard deviations values (below 6.1 %) using MISPE combined with high-performance liquid chromatography (HPLC) were achieved at three spiked levels in three blank samples. Under the optimum MISPE conditions, the wide linear range with the correlation coefficient of R 2 ≥ 0.9950 for five IGs with low limits of detection (LOD) and quantification (LOQ) (0.01–0.08 and 0.03–0.27 μg mL−1, respectively) were obtained. Chromatograms obtained using MISPE columns demonstrated that the matrix interference has been minimized and great interferences around IGs were also eliminated efficiently. These results indicated that the developed MISPE-HPLC method was selective, accurate, and applicable for the determination of IGs in water media. The online version of this article (doi: 10.1007/s00216-016-9625-6) contains supplementary material, which is available to authorized users. This study was financially supported by the Natural Science Foundation of Shandong (ZR2015BQ005) and a research grant from Shandong Analysis and Test Center. Software calculated value from SciFinder Scholar database 2008. http://www.cas.org/products/sfacad/.